The last few weeks have seen a number of leaked images appear of the iPad 3 rear casing, with both internal and external side-by-side comparisons with the iPad 2. Now, new photos posted on Apple.pro reveal both the front glass panel and digitizer, elements of the iPad 3 that so far had remained unseen. The images do not reveal any significant changes from the iPad 2 – there is still a circular home button and hole in the casing for the iPad’s front-facing camera. 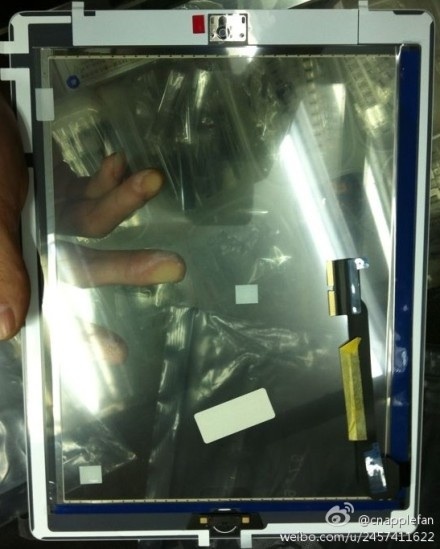 The ribbon cable which runs along the side of the display is the only real point of difference, a feature noted in previous image leaks of the iPad 3’s high-definition retina display. According to the report, the iPad 3 will launch in the U.S. during mid-March of this year, with central Europe, the UK and Japan to follow in April. Apple is expected to unveil the iPad 3 at an event on March 7th.